Now you have the opportunity to meet the beloved characters in Mumindalen. This time, they have been visited by Ninni who - hearing and amazed - has become invisible. In order for Ninni to become visible again, you have to help. Together, you play different games, and for example, save the apple tree from hungry birds using a water gun. In the badminton game, you have to work together - how many times can you beat the ball between you? 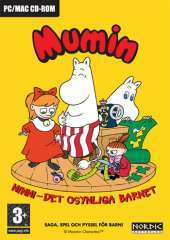 Help Mumin's mother pick mushrooms, and make Ninni happy by sewing her a new dress! You will also find jokes, a board game and other fun things to print, such as invitation cards for your party and paper dolls with many nice dresses for. A completely new story with Ninni in the lead role is also included, and it includes both narration and atmospheric images.